Earthoholics is a social enterprise founded by Ms. Smita D. Shirodkar. An M.Com graduate and MBA in Operations, Smita started working part time in her father’s consumer electronics business since college and later full time handling production and procurement for his company and eventually founded Earthoholics in November 2011. She discovered a green passion and her friends Priyanka, Vishal, Rahul and Bhavesh supported her by volunteering for all the activities whenever they could. 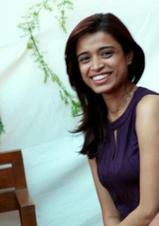 Anuradha, the youngest team member's dedication and commitment surely helped Smita start the Earthoholics Green Journey! Earthoholics has encouraged a change in practices and touched lives of more then 1,00,000 people through their green awareness workshops, exhibitions like Nature Bazaar, Urban Farming Show & customized green events like Gardening Gyaan Day for Panasonic Experience Center, Nature Week for Deutsche Bank, Earth Day Celebrations at Phoenix Market City & many more. Earthoholics aims to do every bit to spread awareness & encourage a smallest change in the way we live so that we all can have a healthy life for ourselves and our 'Planet Earth'.